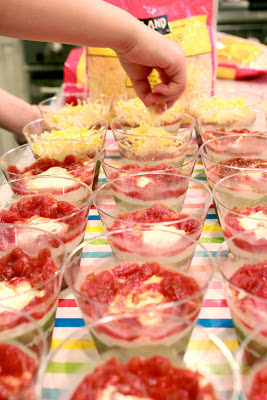 A necessity for your next fiesta or a great appetizer for any outdoor gathering this summer... You can make these individually (as shown) or you can layer the ingredients in a baking dish or shallow bowl--whatever is handy (your guests will be more impressed if the containers are clear). This dish can be made up to 24 hours in advance--but don't add the shredded cheese and other "garnishes" until serving day. Large bag of "sturdy" tortilla chips. 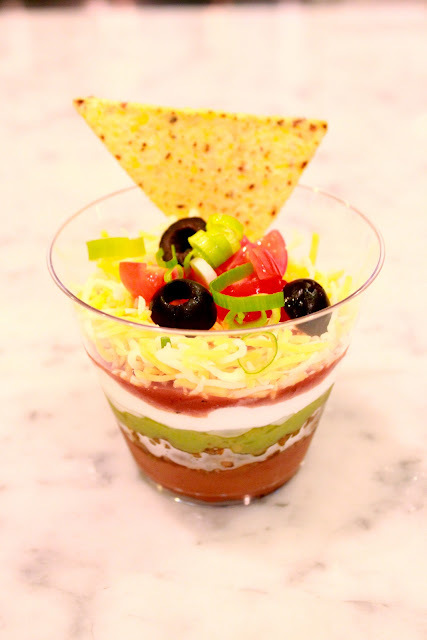 Layer your ingredients into your serving container(s)**: refried beans, ground beef, guacamole, sour cream, salsa, cheese, tomatoes, black olives, green onions. **If you're making individual servings, plan to use about 2 ounces each of refried beans, ground beef, guacamole, sour cream, and cheese.